From The Hunger Games to Star Trek, sci-fi's love affair with outlandish fashion. threads personal style consultant, Jenny Hulme guides us through futuristic fashion tips from the movies. Costume designer Judianna Makovsky started creating The Hunger Games world of Panem first by giving it a mid-century, 1930s to ’50s Americana feel. For the inhabitants of Panen’s Capitol City, she combined 1930s references with 18th century whimsy and drama. Bright, brazen designs with voluminous shoulders, dramatic ruching and theatrical hats. For the outlandish Effie Trinket (played by Elizabeth Banks), costumes were inspired by the work of Italian fashion designer Elsa Schiaparelli and Marie Antoinette. As well as pink wigs and pointy shoes, Makovsky insisted that Banks’ make-up was powdered and eyebrowless, giving an overall look that is high fashion, ghostly and just a little scary. For his 1997 sci-fi film The Fifth Element, Luc Besson enlisted the skills of high-end French fashion designer Jean-Paul Gaultier. Gaultier let his imagination run wild, creating a fantastical look not only defined by unusual materials, but with references to the past. His signature style is very much in evidence, with crinoline hoops worn as skirts, exaggerated military shoulders and ripped dinner shirts. The character of Leeloo, played by Milla Jovovich (pictured) wears some of the most provocative costumes. Her white bandage outfit at the start of the movie is typical Gaultier, and teamed with her distinctive orange bob, is arguably the film’s most memorable image. The fashion world has a seemingly never-ending love affair with the 1982 classic Blade Runner. The film successfully combines influences from both the 1940s and punk, mixing it up to give an altogether futuristic look. 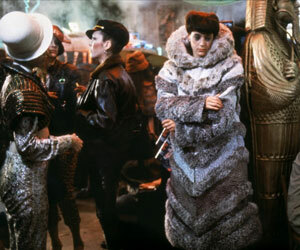 Replicant Rachael (Sean Young) who is the love interest to Harrison Ford’s Deckard, wears outfits consisting of heavily padded shoulders and full-length fur coats. Some 30 years after the movie’s release, Rachael’s sartorial influence was all over the AW12 catwalks, inspiring metallics at Chanel, caped mini-dresses at Gareth Pugh and mega shoulder pads at Vivienne Westwood. The Star Wars films feature numerous iconic (and often somewhat bizarre) costumes. Carrie Fisher as Princess Leia, famous for her donut style hair-do, had her fair share of the best ones. Quite possibly the most memorable outfit of the lot is the gold bikini she wore while enslaved by Jabba the Hutt in Return of the Jedi. A quick Google search proves just how popular the look still is, with hundreds of sites devoted to the bikini, or to selling replica versions. And how many other film costumes can claim to have inspired an episode of Friends over 20 years later? 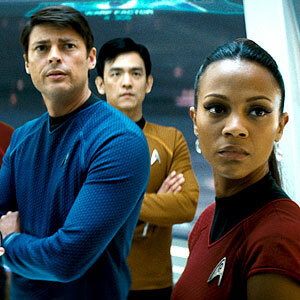 The 2009 Star Trek film has to have one of the best colour palettes in sci-fi. Costumes were designed by Michael Kaplan, who also worked on Blade Runner. Kaplan aimed to keep the 1960s feel of the original TV series, while giving the uniforms a more sophisticated edge, going as far as developing a whole new fabric with the boomerang logo incorporated. Shades of mustard, teal and burgundy not only look visually great, but are designed to represent each character’s job role. The overall effect brings the movie right up to date, and echoes the collections of current fashion favourites Balenciaga and Raf Simons. This article comes from our first online edition. Future editions will only be available to those who sign up to receive them, so make sure you don’t miss any great stories by clicking here now. Jenny Hulme has worked in the fashion industry for over ten years, starting out in the buying department of high street giant Topshop, and currently as buyer for ethical clothing brand People Tree. She is passionate about all aspects of design and style and their influence on our everyday lives.